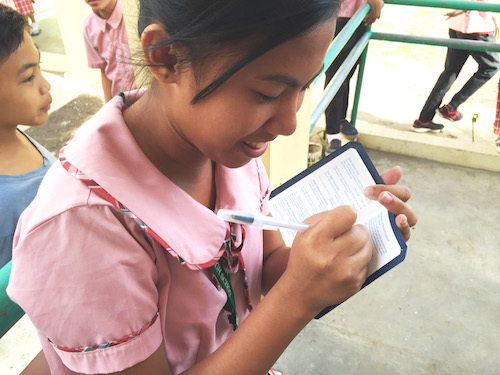 A young student signs her brand new copy of God’s Word after praying to receive Christ during the 2016 Philippines International Scripture Blitz. In January, Gideons and Auxiliary from the Philippines conducted the 2016 Philippines International Scripture Blitz. They were joined by an international team of Gideons from Australia, the British Isles, Finland, Germany, Japan, the Republic of China, South Africa and the USA. With a Scripture goal of 1.5 million copies of God’s Word, there was much excitement among the team members in anticipation of how the Lord would show up during the two-week event. However, the number of Scriptures they could distribute wasn’t what was fueling their activities. “From the beginning, we agreed this blitz wasn’t about how many copies of God’s Word we could distribute, but rather how many souls could we touch,” says assistant team leader, Jeff Audrain, a Gideon from Nashville, TN. 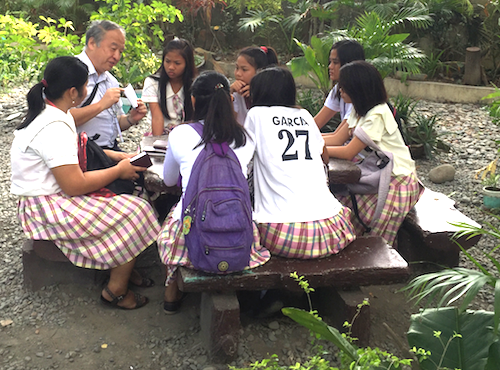 Students listen as a Gideon shares God’s plan of salvation during a lunch break. Gideons were eating lunch at a local restaurant in Mabalacat City when they noticed a group of students reading the New Testaments presented to them during a Gideon distribution that morning. One of the Gideons walked up to the students and asked if they understood what they were reading. A boy named Darryl, confessed he had some confusion. Their conversation ultimately led to a discussion with the students about understanding God’s ultimate plan for their lives. The Gideon told them about man’s broken relationship with God, caused by sin, and the need for reconciliation with God. The students were excited to hear and read for themselves of Jesus’ sacrifice as an acceptable payment for our sin. The Gideon explained, they could each pray to receive Jesus as Lord and Savior. They all prayed together to receive God’s gift of forgiveness and salvation. Then they held a short devotional and the Gideon reminded them to share the good news of the Gospel with others. 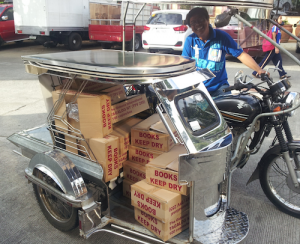 This motorcycle sidecar filled with Scriptures in the Tagalog language is just one example of the resourcefulness of the Philippines’ Gideons in carrying out the Scripture blitz. During the two weeks, Gideons and Auxiliary saw students, waiters, waitresses, teachers, a school principal, sales clerks, and people from many other walks of life choose to receive Jesus as Lord and Savior. By the end of the blitz, the teams had distributed 1,551,922 copies of God’s Word. A Gideon explains God’s plan of salvation during the Philippines International Scripture Blitz. The Gideons International was first organized in the Philippines in 1953. Today, camps operate throughout the country with over 2,300 Gideons and 1,500 Auxiliary. Prior to this 2016 International Scripture Blitz, more than 68.3 million Scriptures had been placed and distributed there through the efforts of The Gideons International. We thank our members, pastors, churches, donors, and the many others whose faithful prayers and financial support helped make this blitz a success. We also thank our members who sacrificed their time and money to participate in this blitz. Most of all, we thank God and give Him the glory for all we believe He will accomplish through each Scripture distributed in this blitz. What a mighty God we serve. Please pray the Lord would continue to move in the hearts of those who received Scriptures during this blitz. All glory to God almighty for the Philippian blitz miracle. God bless also Blitz team and Gideon’s ministry around the world. OUR GOD ALWAYS PERFORMS GREAT AND WONDROUS WORKS with and through His people to show Himself to those who are without Him – the power of His Majesty, His love and faithfulness, His kindness and forgiveness, His grace and mercy. I thank You and praise You for the promise of Your heart Lord Jesus, that You do not want any to perish – that You will forgive all sins ( to everyone who admits their sins and ask for forgiveness) as far as the East is from the West and never remember them again against those who have asked to be forgiven and taken You as their Lord and Savior. Your Word tells us that: You have a plan for us – a plan for good and not for evil – to give us a future and hope …. Lord Jesus, thank You for that promise, thank You that the Gideons can depend on You to continue to lead and guide them, to put upon many hearts to support the WORK that they are doing in Your name to bless all nations with the knowledge of being able to receive eternal life through Your Son, Jesus Christ. We, who support the Gideons, praise and thank You for giving us the opportunity to be a part of them, to be a part of precious souls being won for You. I will share this exciting news with our Auxiliary at our camp meeting this evening.